Do you feel cold all the time? Some of us know what it's like. which gives direction to the thyroid gland. bodies burn food for energy (see below). increase metabolism in order to create more heat. soul in that room full of obnoxiously comfortable people. 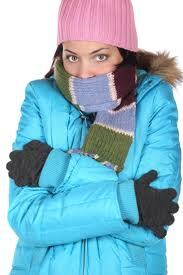 Did you know that skipping meals can make you colder? time, skip a meal here or there. could be to blame for your seemingly unusual feelings of cold. in order to ward off the cold. 3. High Blood Pressure, Cold, and Salt. bottom line: bad, bad, bad. hypertension is bad because it could lead to kidney disease. your treatment against high blood pressure. 4. How’s Your Immune System? If it´s Bad, Stop Smoking. from 2009, is to stop smoking. than workers who don’t smoke). problems at once, by putting down that cigarette? 5. Do You Have Hypothyroidism? Are you usually the one who wants the windows closed or thermostat turned up when you are in a room with other people?